Watch: Are Pretzels Better or Worse? A few years ago, I bought a hot air popcorn popper at a yard sale for 25 cents. It was one of the best investments I ever made. On the way home, I stopped by the grocery store to pick up a bag of popcorn kernels—for less than the cost of a bag of potato chips—so that I could pop a batch of fresh, hot popcorn right away. That was the beginning of my love affair with popcorn. Now I’m obsessed. I keep a bag of popcorn kernels on hand for whenever I need a quick and easy snack. While I do love a little butter on my popcorn every now and then, I eat popcorn a lot. So to keep it healthy (and delicious), I experiment with different flavor combos: Parmesan cheese and cayenne (an EatingWell staff favorite), rosemary and olive oil, cumin and chili powder. The options are endless and if you skip the butter, popcorn is more than just an inexpensive tasty snack: it offers some pretty fantastic health benefits, too, according to a recent story we published in EatingWell Magazine. 2. 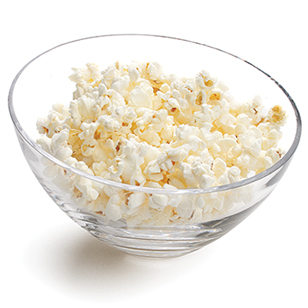 That same 3 cups of popcorn will only cost you a mere 105 calories—provided you don’t add butter. 3. Gram for gram, popcorn boasts three times more polyphenols—antioxidants linked to improving heart health and also to reducing cancer risk—than kidney beans (the highest vegetable polyphenol source) and four times more than cranberries (the best fruit source), according to recent research out of the University of Scranton.